Laser sights can be a valuable tool for shooters. They can aid in low-light shooting, allow for quick target acquisition and, some claim, act as a deterrent in defensive situations. Lasers do not take the place of shooting fundamentals and they may not be for everyone (there is certainly not a consensus on their use), but they can be a useful supplement to a firearm’s fixed sights. As long as they are properly aligned, that is… But what does “properly aligned” mean? Generally, shooters will zero their weapon sights – whether it is a laser, an optical sight or something else – for a certain distance. What does this mean? Picture the trajectory of the projectile as it leaves the muzzle of a firearm. Disregarding bullet drop, wind, atmospheric conditions and things of that nature, the trajectory should be roughly along a line parallel to the center axis of the barrel. Ideally, to target where the projectile will impact, the shooter would want to sight along that trajectory. The line of sight for a scope or iron sights is a straight line between the shooter’s eye and one or more points in the sight. That straight line is a bit easier to visualize for a laser sight. 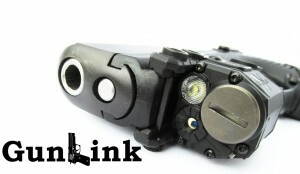 Since sights are typically placed above, below or to the side of a firearm’s barrel rather than looking down it, something called parallax is introduced. Due to this offset, the line of sight and the center axis of the barrel are almost – but not quite – parallel. At some point downrange, where the two lines intersect, is where the sights are zeroed. The image above shows this concept. Zeroing a sight for a certain distance is easy enough to understand and accomplish but, as you can see, at ranges other than the distance for which the sight is zeroed, the point of impact (POI) will vary from the point of aim (POA). In this example at closer ranges the round would impact above the laser dot while rounds fired at longer distances would impact below the laser dot. The further the target is away from the zero distance, the further the POA will be from the POI. Greater distance between the center axis of the barrel and the sight will increase the severity of the POA vs POI difference because the angle between the two lines will be greater. There is an alternative configuration for laser sights that is popular with some shooters that eliminates the problem of the sights only being accurate at one distance. The downside is that they are not entirely accurate at any distance. The upside, however, is that the inaccuracy is the same at all distances (again, disregarding wind, bullet drop, etc.). The image above shows the constant offset scheme in which the line of sight is parallel to the barrel’s center axis. You can see that the line of sight never intersects the line of the bullet trajectory, so the projectile will never impact where the laser dot is. However, since the lines are parallel, regardless of the distance the point of impact will be the same distance, h, above the laser dot. Of course, in the real world, there is bullet drop so gravity will eventually pull the projectile down across the laser beam. According to this ballistic chart, assuming a 2″ distance between the barrel axis and the laser aperture, that will happen somewhere after 50 yards (150 feet) – much, much farther than the average defensive firearm situation which happens between 0 and 21 feet. At these distances, bullet drop is less than bullet diameter. It could be that this discussion is entirely academic when talking about practical handgun use inside of 7 yards. Some may think that it doesn’t make any difference if their bullet impacts an inch or two away from the little red or green dot. Some may prefer to trade not dealing with parallax in exchange for remembering an offset. The same sight configuration may not be the same for the target shooter who uses a laser because they can’t quite make out their iron sights anymore as the CCW-er who has a laser only for their defensive firearm. Regardless of which configuration you choose if you are using a laser, just remember that things can go wrong in the real world. Batteries die, electronics get wet, connectors corrode, pocket lint gets in the way of laser apertures. A laser isn’t a substitute for knowing how to accurately shoot your firearm with low-tech iron sights. If Murphy’s Law holds true, when you need it most your laser sight will be, at best, a supplement to your skills and training.